Hi Erica! Can you tell us a bit about your latest book, Deadly Sweet Lies? And maybe, for the sake of those who haven’t read the first book in the series (Sing Sweet Nightingale), you can tell us about that one too! Julian escapes into a dream world every night, using it as a reprieve from dealing with his irresponsible, addicted mother. It’s the one place where someone else takes care of him instead of the other way around. On the other side of the country, Nadette is being stalked by beautiful beings she wishes she could call hallucinations. They tempted her with kind words and incredible landscapes for two years before the pleas turned to threats and the world she saw through their portals became a pitch-black nothingness that terrified her. They’re on opposite sides of the country. Julian is a consummate liar while Nadette is a connoisseur of the truth. Nadette came from a family of ten that never had to worry about money, but Julian is the only child of a woman who usually can’t manage to pay the rent on their crappy apartment. The only thing that draws them together is the dream world one loves and the other loathes, but the truth about the Balasura may lie somewhere in the middle. Figuring it out before the Balasura stalking Nadette find her is going to be the hard part. Deadly Sweet Lies is the second book of The Dream War Saga, but it’s not quite a sequel. Mariella and Hudson’s story is told in Sing Sweet Nightingale—loss, grief, loyalty, mistakes, forgiveness, and a dream world that fools you into thinking you’ve found paradise—but two new narrators pick up the story for book two and the timelines of the two stories heavily overlap. 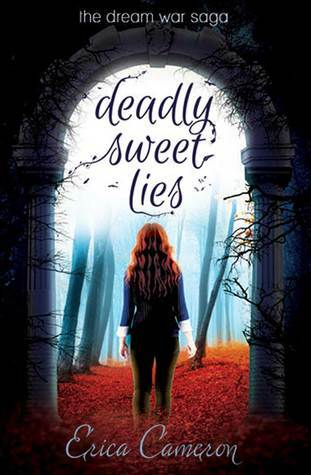 Deadly Sweet Lies read almost like it’s a second book one because it doesn’t repeat much that we’ve learned in Sing Sweet Nightingale. Instead, it expands on what we’ve already seen, correcting some assumptions and introducing readers to a more in-depth look at the Balasura and the world they live in. Plus, several of the characters from Sing make appearances in the book! And there are a lot of Easter eggs if you look for them. Especially if you’ve also read the Dream War Saga short story contained in the Doorways to Extra Time anthology. One of the characters from Deadly is introduced in “Whatever it Takes”! If The Dream War Saga had a soundtrack, what would be one of the songs on the playlist? I don’t create playlists while I write, but I definitely have music that reminds me of the books! For Sing Sweet Nightingale, “Blinding” by Florence + The Machine is basically the book’s official theme song. It’s a little scary how accurate the lyrics are for that book. Deadly doesn’t have as specific a theme song, but I have playlists for the book as well as each of the narrators here: http://byericacameron.com/wp/extras/playlists/. You can also follow all of my playlists (book specific and just for fun) if you follow me on Spotify here: https://open.spotify.com/user/1261447593. Yay! Julian deserves all the love, definitely. As for who I like the most (you realize this literally feels like picking a kid I love the most, right? ), I probably would have to say Hudson. He was the anchor of the first book that kept me sane during the multiple rewrites that story had to go through, and I’ll always have a special fondness for him. Plus, he’s Hudson. He’s a massive teddy bear made of marshmallow fluff wrapped in a shell that looks like Drago, the villain from Rocky IV. It’s adorable. When I was thirteen, my language arts teacher asked us to get into groups and create a picture book. Literally a picture book, like for little kids. I asked if I could work alone and then, after she reluctantly agreed, I turned in a 40-page mystery novella that may or may not have been inspired by the James Patterson’s Alex Cross novels that I’d been reading at the time. I should have known then that I’d be a writer, but I didn’t figure it out until I’d almost graduated college in 2007. What was the hardest and easiest thing about writing Deadly Sweet Lies? Julian, actually! In an odd twist of fate, he followed in his cousin Mariella’s footsteps by being an extremely complicated character to portray the way I wanted. It took multiple rewrites to figure out how to write Mari, and though Julian wasn’t quite that persnickety he definitely took a lot longer to nail down than Nadette did. If you were the one of the characters in your own stories (in The Dream War Saga, I mean), what power do you think you would have (or prefer to)? Given how many allergies I have, healing would be useful as all hell. Well, I can neither confirm nor deny future narrators, but right now I’m planning on the series including two additional titles. I will say that some narrators do repeat in the last two books and that over the course of the four novels there will be six people total who get the chance to tell us what they see. Unfortunately, I don’t have any release dates or official information for the last two books! Right now it’s out of my hands. Hopefully, if enough people find the series and love it, we’ll get to see those final two stories eventually! Mention three of your favourite books EVER! These questions are always so difficult! I have more books in my closet than clothes, so picking just a couple of them is painful! ;) Honestly, there are so many books that have impacted my life in one way or another that…well, just know this list is FAR from complete. That being said, my first favorite author was Tamora Pierce (yes, I’m cheating by naming an author instead of a single book! ), and I’ll always have a soft spot for her stories. I am also a huge admirer of Jacqueline Carey’s Kushiel series, too. Those books are so unbelievably epic and beautiful that they kind of make me despair of writing anything half as good. They’re also very much not YA titles, so if you’re looking into reading them make sure you check out some reviews for content warnings. I read Water For Elephants by Sara Gruen when I was working at Borders years ago, and I think I hand-sold ten copies of that book a week because of how hard I pushed it on people. The writing, the characters, and OH MY GRACIOUS THE ENDING. I love that book immensely. It’s incredible. I’ve heard that you write another series too! It’s called Laguna Tides, isn’t it? Can you tell us what it’s about? I love the Laguna books! I co-authored them with Lani Woodland, who is one of my best friends, and they’re set on a fictional island off the coast of Laguna Beach, California. The series (which will include five books when it’s complete) follows a group of friends through their senior year and slightly beyond. They’re not at all sequels, though. These are connected companion novels, and each one is a separate entity with a new narrator. Taken by Chance is Dare Andrews’ book. It’s about family, asking for help, optimism, and cupcakes. There are definitely more than a few cupcakes. The second book, Loyalty and Lies, is Axl Derringer’s story. Though it’s still a straight contemp novel, Axl’s book deals with issues that are a little darker than Dare’s book. He faces addiction issues, dealing with huge losses in his life, betrayal, distrust, a pregnant ex-girlfriend, and a lot of other things. He’s beautifully broken and I kind of love him, honestly. The third book should be coming in the spring of 2016 sometime and it will give you an in-depth look into Brandon Whitley’s life. After that, Kody and Jason finally get their turns! You’ve written two series in two different genres (Fantasy and Romance). How did the writing process differ between genres, was it difficult to switch? I love genre jumping! I’m definitely going to keep doing it as much as I can manage. The approach and the process are very different. There was a lot of worldbuilding for the Dream War books, for example, that I didn’t have to worry about with the Laguna series. The Laguna books almost felt like a vacation to write after the intricate complexities of the Dream War books. Of course, I had to make my life even more complicated. My next two series will be completely different. Later this year I’ll be releasing a two-book thriller series with Riptide’s new YA imprint Triton Books and in 2017 Entangled Teen will help me launch the first book of an epic fantasy trilogy! After that I have ideas for a couple of different YA sci-fi novels, a few YA contemporaries, and a potential adult asexual romance series co-authored with a friend of mine. For such a successful author like yourself, can you share one writing tip or piece of advice to aspiring writers out there? My number one piece of advice, for myself and for everyone else, is this: You cannot edit something that doesn’t exist. The only way you’ll learn to write is by doing. Reading books (both novels and how-to guides) will help, but the harder part is finding a way to put those tips and tricks into your own work. Listen to advice and try it all if you’re still searching for your method, but DO NOT hold onto a habit, rule, or genre just because it works well for someone else. As long as you’ve got a book at the end of your process, how you created it doesn’t matter much. Thank you for letting me interview you! It’s been a pleasure!